Lawyer for the Palestinian Prisoners Society (PPS) said, after visiting a number of Israeli prisons, that the health condition of four Palestinian hunger striking prisoners has dramatically deteriorated due to both Israeli medical negligence and the fact that they have been on hunger strike for more than 63 days, the Palestinian Information Center reported. (PNN) Hunger striker Muammar Banat’s family told a PIC reporter that his health condition has been getting worse due to the Israeli medical negligence, calling for his immediate release. The families of the hunger strikers Akram Fessissi, Amir Shamas, and Wahid Abu Maria said that they suffer acute health deterioration. 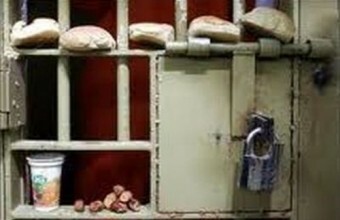 The Palestinian Prisoner Society (PPS) said that 12 Palestinian detainees have declared hunger strike in Israeli jails. PPS said that Ofer prison administration pressured three of the hunger strikers to put an end to their protest steps. Following his visit to Ofer prison, PPS lawyer said that Aref Harbiyat, 30, and Ayman Etbaysh, 33, and Ahmed Abu Ras, 31, have continued their hunger strike since February 28, 2014, in protesting of their administrative detention. Harbiyat told the PPS lawyer that he only drinks water and refuses to undergo any medical tests. Harbiyat said that he in currently suffering sharp pains all over his body. Harbiyat said that the prison administration has deprived him of family visits for three months, as a punishment for his hunger strike. Furthermore, the hunger strikers are being held in a dirty room from 6 am to 10 pm each daily, to pressure them to end their hunger strike, he clarified. Etbaysh said that his own hunger strike came in protest over the Israeli authorities’ reversal of its approval to implement the agreement achieved after his hunger strike which lasted for 105 days. He suffers from exhaustion and frequent fainting. The hunger striker Abu Ras also suffers from frequent fainting and aches in his legs and stomach.